The first mistake most DIYers make is buying the cheapest treadmill they can find on Craigslist, or using an old one they already own. Like dining out in New York City, the price of the product is not necessarily an accurate reflection of its quality. Many very fancy, feature-rich treadmills would make a terrible choice for a treadmill desk. The reason is that running treadmills are designed for short-duration, high speed use, and their drivetrain is geared specifically for that kind of use pattern. They have insufficient torque for slow walking speeds and are susceptible to damage if used this way. A true office treadmill has a lower top speed and will be geared specifically for hours of daily walking. Just as you wouldn’t bring your laptop with you on a mountain biking ride, don’t plan to exercise aerobically at your desk. 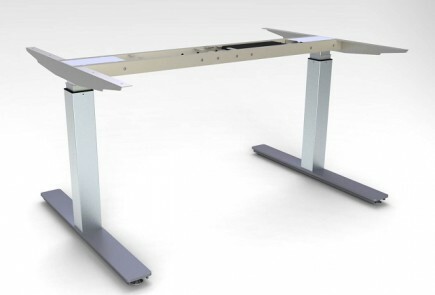 Once you place a stable, ergonomically proper desk environment around the treadmill base (removing the handlebars in the process), it’s going to be hard to pound on it at running speeds without risking injury or damage to your equipment. Not only that, but beyond a slow pace of 2 mph, users suffer a significant drop to typing accuracy and multitasking ability. If you’re going to build your own workstation, you’ll need a dedicated walking treadmill to go with it. Go to the gym if you want to actually run on a treadmill. Keep in mind that there is a huge difference in component quality between treadmills marketed for home use and those marketed to professional gym operators, sports teams, and rehab clinics. The Mean Time Between Failure design goal for a home unit can be as little as 50 hours even for major brand fitness equipment manufacturers. These manufacturers know that 85% of home fitness equipment are never used again after the first few weeks. That’s one reason why you can always find so many treadmills for sale on Craigslist. See our comparison review of treadmill bases for the best office treadmills to use with desks. Any motor specifications other than the torque of the motor when running at speeds of 1-2 mph is utterly irrelevant. Manufacturers invent all sorts of statistics to try to position their products against the competition that are either entirely meaningless or meaningless at the speed range of under 2 mph. The reality is that treadmill manufacturers never publish their torque graphs, only the fairly irrelevant HP (horsepower) rating, as if the torque is the same at all speeds. With the low-cost DC motors used in most residential treadmills, the horsepower rating is derived at maximum RPM, i.e. when the treadmill is running at its fastest setting. When walking at 1-2 mph, the motor will only produce a fraction of its rated horsepower. Because walking induces far more strain on the motor than running does, when you need the most horses to pull the belt along, the motor delivers the fewest. This leads to overheating of the motor and electronics, and—if this goes on for too long—premature failure of the component. We’ve seen 2.5 HP motors used in high-end running treadmills burn out every few months under the strain of daily walking at 1-2 mph for hours at a time. By the same token, we’ve seen 1.5 HP motors in low-cost treadmills originally designed for rehab applications (typically topping out at 4 mph) last forever with constant use in a treadmill desk application. This is because rehab treadmill are designed with drive trains that that provide their highest torque ratings (i.e. run at their highest RPMs) at much slower speeds than conventional cardio exercise treadmills are designed to run at. There are many factors that come into play to determine whether a treadmill will do a good job at pulling a user of a particular weight along without undue strain. In addition to the HP of the motor at walking speeds, there is the diameter and weight of the flywheel, the drive belt ratio, the roller diameters, and the friction co-efficient between the belt and the deck, to name but a few. Too small a flywheel, for example, can lead to exaggerated pulsing of the belt with every step, which is a very discomfiting sensation for most people. A better guide than motor HP is the weight limit of the treadmill. Because there is no industry standard for deriving weight ratings (and many manufacturers overstate the limit by 50 to 75 lbs.) this is not a terribly accurate indicator of the treadmill’s overall capacity, but it can be a more rational proxy than the motor’s HP rating. Because weight ratings are derived at running speeds, we always recommend buying a treadmill with at least 100 lbs. greater weight limit than the heaviest individual who will be using it. Some manufacturers are better than others at actually testing their treadmills on automated equipment for long periods of time to determine what the weight rating should be. But others, such as RebelDesk, TreadDesk, and Exerpeutic, seem to make up their numbers in a marketing meeting. You’ll be walking at a level angle at your treadmill desk, so the base does not need an incline function. Remember, the goal is to stay in the “NEAT” heart rate range, not to exercise or sweat. While having an incline mechanism built in isn’t going to impact your exertion level if kept flat, it will raise the entire treadmill platform a little higher off the ground. Most people seem to prefer to be as low to the ground as possible when using a treadmill desk. The first thing you’re going to do with the display console is remove it, so don’t pay up for fancy racetrack graphs, pre-programmed routines, or built-in TVs. The iMovR ThermoTread GT, with its touchscreen LCD desktop console, is the most popular walking base used by DIYers who want the very latest technology for their treadmill desk workstation. The vast majority of people who buy “personal quantification” devices stop using them after a few weeks. Of course, charging consumers extra to give them performance statistics of their exercise is nothing new to fitness equipment. Don’t fall for it. Those calculations are quite mysterious, as no one calculation method will work well at running speeds and at slow waltzing speeds, and there are too many factors they can’t take into consideration, such as your general fitness level (resting metabolic rate, etc.). The only thing you really should keep track of when using a treadmill desk is how many hours you are moving instead of sitting… that’s the big health reward for using a treadmill desk. With most of today’s treadmills—including those with a Bluetooth interface—the task of compiling that information accurately, every time you exercise, is time consuming and soon becomes a mind-numbing productivity sink. The one exception to this is the iMovR ThermoTread GT, which not only tracks your walk time but also your standing and sitting time, accurately. The price usually has little bearing on a running treadmill’s suitability for walking. Most of the upgraded features on fancy cardio treadmills are of no use when you’re working at a 1-2 mph walking pace. Within the constraint of walking treadmills, however, price typically does have some pertinence to component quality and warranty support. When running, you’re kicking the belt backwards and are in the air part of the time. When you’re walking at 1-2 mph, the belt is pushing your entire body weight while overcoming friction between the belt and the deck. Torque is the rotational force to actually turn the belt rollers. Exercise treadmills are built with motors designed for peak torque performance when running at much higher RPMs than you’ll see while walking. At slow walking speeds, the motors often lack the necessary torque. What happens if the motor doesn’t produce enough torque? The first thing you’ll notice is very discomforting hesitation or “pulsing” when your foot comes down on the belt. If you frequently lubricate your deck and belt, you may be able to reduce this hesitation, but most people don’t take on the messy job. Another thing that can cause belt hesitation is when manufacturers skimp on the weight and diameter of the flywheel that is attached to the motor. A strong flywheel takes more space under the cover and increases shipping costs. The function of the flywheel is to moderate the effects of stepping on and off the belt. Because the flywheel sizing is hard to determine off a spec sheet, you’d be very wise to never buy a treadmill sight unseen. ALWAYS take it for a test walk before plunking down your cash. Even though you won’t be using it for running, it’s not a bad idea to take a run on it just to get a sense for how strong and vibration-resistant the frame is. Far more serious and insidious than belt hesitation, however, is discovering your motor or controller board has failed within the first few months, if not weeks. We had one low-cost ($699) walking treadmill base fail on us in just 20 minutes, and that was a brand new unit. You will usually have no warning when, in the middle of your work session, the treadmill comes to a very abrupt halt, possibly throwing you. Sometimes, this will be accompanied by a loud popping noise from a fried capacitor that failed trying to deliver too much power to the motor. If the unit is out of warranty, you’ll be better off buying a new treadmill. Because 99% of the treadmills on Craigslist and in people’s garages are not appropriately motorized for the slow walking application, you should be prepared for this eventuality. It is a very good argument for buying an inexpensive new unit with at least a three year warranty on the motor and electronics. Make sure you get written verification from the manufacturer or seller that they will honor the warranty even if you use the treadmill just for walking. The ideal treadmill base, if you can find it, is one that was designed for the office walking application, or at least for rehabilitation. With a rehab treadmill, you can remove the handrails and wheelchair ramp and you’ll have a basic walking treadmill with the correctly sized motor for slow walking speeds. Of course, with a real office treadmill, you won’t have to do anything more than plunk it down under the adjustable-height desk of your liking to complete your workstation. Naturally, the heavier the user on a treadmill, the more torque you’ll need your motor to have. This goes hand in hand with the strength (thickness and weight) of the tread deck. Thicker decks raise the cost of a treadmill and cost more to replace and to ship, but under-sizing the deck could lead to quicker wear from shear stresses (i.e. degradation of its lamination), which could then lead to premature motor and/or power controller board failure or exaggerated pulsing of the belt with each footstep. The more the deck flexes, the faster the laminate coating will break down and the sooner you’ll be replacing it. The best treadmills use 1″-thick decks. You might get away with a 3/4″-thick deck for a while, but expect to replace it much more frequently. There are additional factors to be considered such as the deck and belt materials, lubrication method, and other aspects unique to specific makes and models of treadmills. As a very general rule of thumb is the heavier the treadmill, the longer it will last in a walking application. The width of the treadmill belt is such an important factor, we have an entire page devoted to it in belt width ergonomics. The bottom line is you’re mostly likely to find a 20″-wide belt on the best brands of walking treadmills and should shy away from anything narrower unless you have a fairly narrow walking gait, and then you might be able to tolerate an 18″-wide belt. 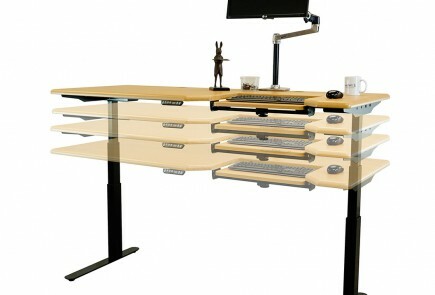 Building a desk around the existing console, pedestals, and handlebars is a formula for instability and bad ergonomics. Unfortunately, the location of the console usually interferes with the ideal place to install your desktop. For this reason, you’ll probably want to remove the console and the pedestals that hold it up, as well as the handlebars. There are typically a few cables channeled through the pedestals, which you can easily disconnect from the console and pull off the pedestals. If the handlebars have pulse rate sensors in them, simply disconnect the electrical connectors when you remove the handlebars; it won’t adversely affect the computer. The question then becomes, what to do with the console? The simplest thing is to lay it on your the desktop surface. Since walking on a treadmill induces a lot more load on the motor, it is important that you frequently lubricate the deck (see our comprehensive advice on How to Lubricate a Treadmill). Friction is the enemy, and there are two things you will need to do on a regular basis to keep the friction from building up: 1) lubricate the deck monthly, or as soon as you feel any increase in friction or hesitation when you step on the moving belt, and 2) cleaning all the accumulated dirt that has worked its way into the area between the deck and the belt every few months. To minimize the need for cleaning, consider investing in a pair of walking shoes that you only use on the treadmill desk so you don’t introduce unnecessary dirt to the environment. Some manuals will also recommend removing the covers from time to time and cleaning around the motor area to reduce the chance of dust and dirt getting into the bearings, shafts, and windings. Units with internal fans to keep the motor cool also tend to draw a lot more dust to the inside and underneath of the treadmill, which needs to be cleaned regularly. Be sure you’ve familiarized yourself with all the procedures for cleaning the treadmill belt and inside the enclosure before selecting the unit you use for your treadmill desk. Some are more onerous to clean than others, and you’ll need to think about having enough clearance around the unit to comfortably gain access to the various bolts and screws involved in the procedure. You’ll also want to make sure you’re able to vacuum under the treadmill, not just around it. Preventing dust and dirt from getting into the motor works from under the treadmill is the single best thing you can do to lengthen the life of your treadmill. This is one more reason to invest in a rubber anti-static treadmill mat to place underneath your treadmill. A mat will also reduce noise a little bit, reduce static electricity build-up, provide a small amount of extra cushioning, and protect your floor. If you are planning to purchase a new treadmill for your workstation, pay careful attention to the warranty plan. Most manufacturers give you a lifetime warranty on the frame, which isn’t very likely to ever break, but what you care about is the motor and lower controller board (the electronics that control the motor). Look for a unit with a minimum three-year warranty on the motor and two years on electronics. If you blow the controller board or motor outside of the warranty period, it may be cheaper to buy a new treadmill than have it repaired. Depending on the fine print in the warranty policy, there is some risk that you may void the motor and controller warranty by using the treadmill exclusively for walking. Eventually, manufacturers will get wise to the number of consumers buying their exercise treadmills for workstations and start rejecting warranty claims from such users. For this reason, the safest bet is to purchase a treadmill base, if not the entire treadmill desk, from a reputable manufacturer with a solid warranty and nationwide service capability. Get all the facts up front before you buy—not just the warranty term, but the claim limitations any additional costs for a service call, the breadth of their service network, what maintenance you are required to perform in order to keep the warranty intact, and any extended warranty options. In this age of transparent e-commerce, checking user comments on Amazon and other websites before investing in a specific treadmill model is essential. You can learn so much from these buyers that you’ll never read in the manufacturer’s brochure or hear from the fitness store salesperson or Craigslist seller. Trust us—you DO NOT want to skip this step! Getting a cheap used treadmill to strip down and place under a desk is one way to build a treadmill desk on a budget, but the hassles and ergonomic struggles may not be worth the savings. We’d like to be able to tell you that buying a commercially-produced office treadmill is a better way to go every time, but there’s a wide spectrum of product quality these days. WorkWhileWalking is the only organization in the world that actually tests these products using a team of expert reviewers. Be sure to read our comprehensive Comparison Review of Standalone Treadmill Bases to get the skinny on the best treadmill desk base options out there.